KUALA LUMPUR: The main players in the light rail transit Line 3 (LRT3) project confirmed yesterday that the government has decided to proceed with the project at RM16.6 billion — just slightly more than half of the earlier cost of RM31.65 billion in May. Malaysian Resources Corp Bhd (MRCB) and George Kent (Malaysia) Bhd said their joint-venture (JV) company, MRCB George Kent Sdn Bhd, was informed of this by Prasarana Malaysia Bhd in a letter yesterday. “The implementation concept of the project will be remodelled from a project delivery partner (PDP) regime to a fixed price contract regime,” MRCB and George Kent said in separate filings with Bursa Malaysia. They said the total cost of RM16.6 billion is inclusive of “land acquisition costs, interests during construction and other costs”. However, they did not provide details of the cost-cutting. The news is in line with a statement by Finance Minister Lim Guan Eng in the Dewan Rakyat on Aug 7, where he hinted the lower contract costs and a change in contract implementation format as a full contract termination would have cost the government RM4.2 billion in compensation costs. With the announcement, the new contract value is expected to reduce the JV company’s profit margin “to a single digit” even after government’s instruction to scale down the project, said a source with knowledge of the matter. It is, however, unclear how the downsized contract will impact companies which were awarded the LRT3 packages by the JV company, the source told The Edge Financial Daily. “The JV partners are still renegotiating their package deals with the relevant contractors,” said the source, who spoke on condition of anonymity as the matter is still being discussed. “Tentatively, that should be finalised by the end of the month,” the source added. Listed companies that have been awarded LRT3 work packages include Gabungan AQRS Bhd, Sunway Construction Group Bhd, IJM Corp Bhd and WCT Holdings Bhd. Also involved in the LRT3 project is elevator supplier EITA Resources Bhd. Guan Eng first revealed on July 11 that the projected total cost of LRT3 — stretching from Bandar Utama, Petaling Jaya to Johan Setia, Klang via Shah Alam — had spiralled to a whopping RM31.45 billion, blaming it on Prasarana’s poor management. He said at the time that six stations would be scrapped, and for the project deadline to be extended from 2020 to 2024 to reduce construction cost. The original estimate when the project was launched in 2015 was RM9 billion excluding PDP fee of 6% combined, other consultant fees, operational and overhead costs, as well as interest payments during construction. It was previously reported that the 6% fee to PDP for work packages tendered to winning bidders would have netted MRCB alone a total of RM948 million. On July 22, documents sighted by The Edge Financial Daily underlined 22 changes sought by Prasarana on the specifications of the infrastructure, such as train length, station designs, track alignment and other related infrastructure like parking lots. The Edge Financial Daily learnt at the time that the scope of work and costs were dictated by Prasarana as per the PDP agreement, and in some instances the board was not aware of the changes requested by the management to the PDP. 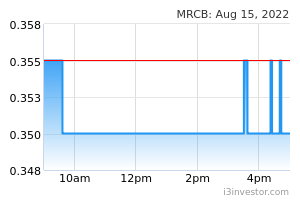 MRCB’s stock gained RM329.63 million in market value in a single day yesterday, closing up 7.5 sen or 10.42% at 79.5 sen. Its market capitalisation stood at RM3.49 billion. 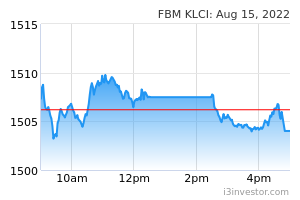 A total of 84.23 million shares were traded, making it the most active counter on Bursa Malaysia. 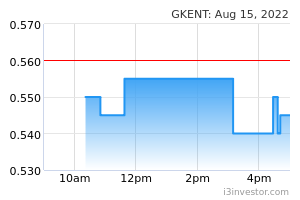 George Kent, meanwhile, rose 13 sen or 12.87% to close at RM1.14, valuing it at RM642.13 million, with 18.58 million shares done. It gained RM72.01 million in a single day.